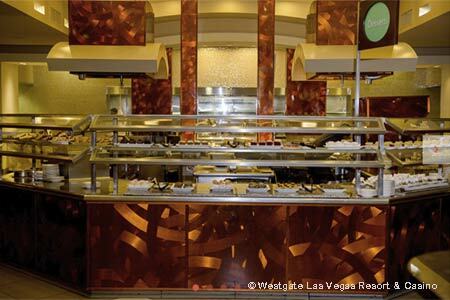 Well-prepared buffet fare in an attractive bistro-style atmosphere. 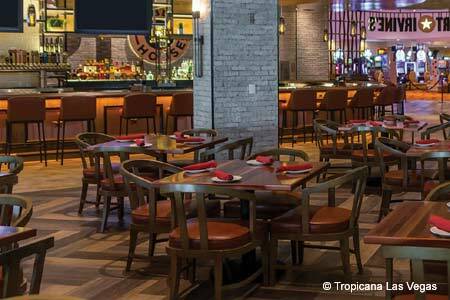 : Designed to resemble a bistro --- a very large and high-ceilinged bistro --- Fresh Buffet at the Westgate Las Vegas Resort & Casino aims to satisfy every taste. Lunch and dinner choices include sushi, pasta, carved-to-order prime rib and turkey, imaginatively prepared seafood, and Chinese specialties such as Peking duck, complemented for dinner by draft beer and wine. The weekend Champagne brunch offers eggs Benedict; there’s also a carving station and shellfish. Save lots of room for desserts, which include cakes and pies, fresh strawberries and an ice cream bar with an array of toppings, plus traditional pastries, and a few associated with fine dining, such as marzipan tarts. Lunch $19.99, Dinner $24.99, Brunch $23.99 (children 2-12 half price). Guests who are Active Service U.S. Military Personnel or U.S. Veterans with a valid ID receive 25 percent off every day.